#ded.bsetelangana.org, D.Ed 2nd Year Hall Tickets 2019 | TS D.El.Ed 2nd year 2019 Theory Exams Halltickets : The Board of Secondary Education, Director of government examinations, Telangana state is going to the Diploma in Education second year annual examinations 2019 in the month of April 2019 (16-04-2019 to 29-04-2019) and time table would be announced in October month for 2019 for D.Ed 2015-2017 batch. The Board of Secondary Education has clearly indicated that the students of the entire the Telangana State may have follow the same methodology. Diploma in Education Second Year annual examinations will be start from as per the announced schedule. All Exams will be held from 09.00 AM to 12.00 noon. 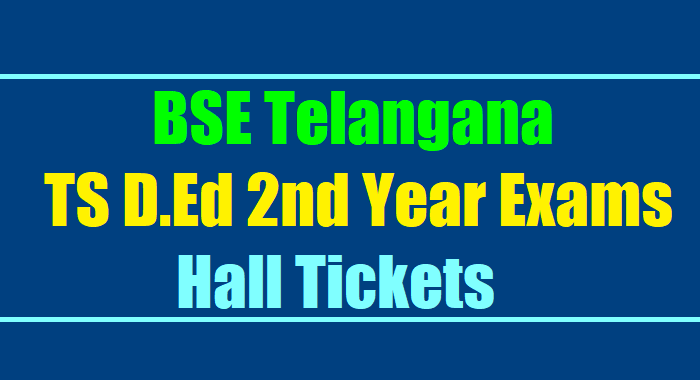 Now the Board officials will upload the D.Ed second year Public Examinations 2019 Hall Tickets on its official new website bsetelangana.org or http://ded.bsetelangana.org/ (In this link, Officials would upload the hall tickets). D.Ed second year Candidates Can download their Hall Tickets from this website. Here also downloading link will be provided soon. So candidates can download your hall ticket given the following link.
' So, D.Ed II Year Exams 2019 should be conducted of Exams as per same schedule"
Step 1: First visit the bsetelangana website by entering the url www.bsetelangana.org. then website will be appeared. Step 2: Search for “TS D.El.Ed 2nd year 2019 Theory Exams Hall tickets” and click on the link. Then another web page will be opened on new tab in your browser. Step 3: Now Select Your District Name, Select your institute Name and Select Your Name. Step 4: After Select your date of birth and click on download button. Then Your hall ticket will be downloaded. Step 5: Take the print out. hi sir when release the ts ded 2nd year result.